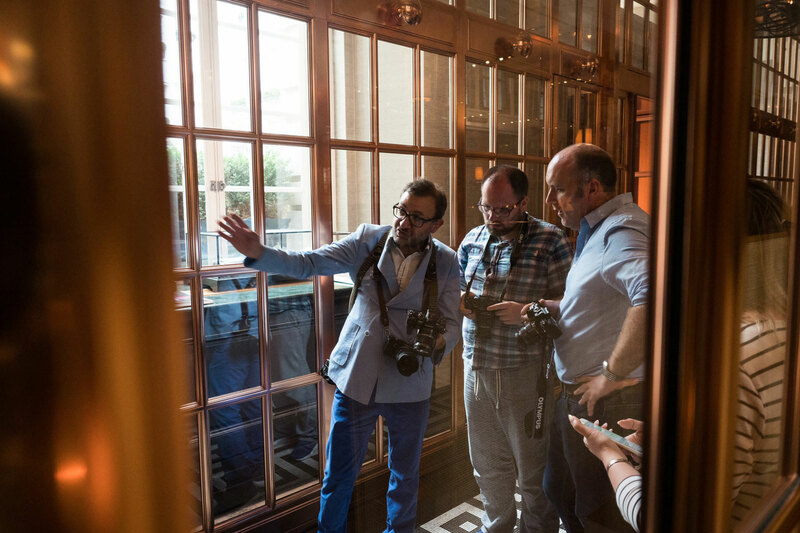 John was once again invited by Olympus UK to host his popular Wedding Photography Masterclass, which on this occasion took place at the Rosewood London. To create this luxury wedding style shoot, John brought together some of the wedding industry’s top suppliers including wedding and event planner Raspberry Bespoke Events, cake designer & maker Unique Cakes by Yevnig and luxury London florist; Emma Soulsby. The day began with an introductory talk about John’s career, including his switch to Olympus kit and the advantages of using the Olympus range for wedding photography. 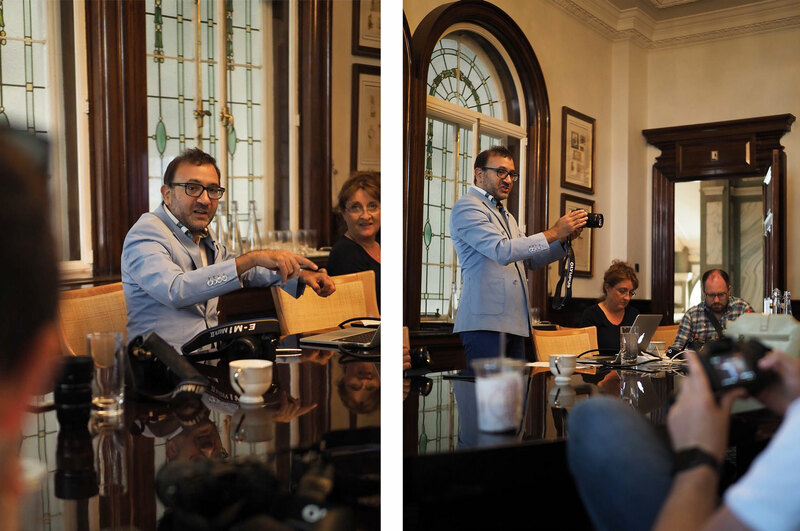 The attendees were invited to ask questions, and John drew on his over 20 years of experience for some expert advice on getting work published in magazines, the difference between style shoots and real weddings, lighting methods and more. The attendees were loaned cameras and lenses and then headed out to shoot the first styled setup; the wedding table. Jen from Raspberry Bespoke Events had elegantly styled and decorated the table perfectly to match the Autumnal theme. Draped with linens by Over the Top Rentals and adorned with flowers from Emma Soulsby, stationery by Armorial, and a magnificent Candelabra from Peekaboo Events, there was plenty of inspiration and detail for the attendees to focus in on. John then split the attendees into smaller groups. While some were photographing the wedding table, a group of 3 were taken to the Rosewood’s iconic courtyard, where they were introduced to the model for the day: Charleen Meredith. Beautifully styled in a dress from Morgan Davies Bridal, with Boe Wright of Botias Hair & Makeup adding the finishing touches, Charleen posed with a stunning bouquet by Emma Soulsby. Each photographer had a few minutes to individually shoot the model, after camera setting and composition advice from John. The group were then given the opportunity to capture Charleen in one of the Rosewood’s dazzling corridors – where the copper framing matched perfectly with the Autumnal colours used throughout the shoot. When all the groups had rotated, it was time for a delicious lunch prepared by the Rosewood chefs. This was also a good time for attendees to look at everyone’s shots from the day so far, and peruse wedding album supplier Sim Imaging’s product offerings, which were on display. After lunch it was time to shoots the pièce de résistance – an incredible wedding cake from Unique Cakes by Yevnig. With advice from John on camera settings and composition ideas, the attendees had time to shoot the cake table with and without Charleen. The day finished with a debrief from John and a the chance for the attendees to ask any final questions. The feedback from both the photographers and suppliers was very positive and a wonderful experience for all who attended. Rosewood London, Raspberry Bespoke Events, Emma Soulsby, Unique Cakes by Yevnig, Botias Hair & Makeup, Armorial, Peekaboo Events, Over the Top Rentals, Morgan Davies Bridal, Sim Imaging and Charleen Meredith.